Conservation work -a therapeutic intervention? Castlebeck is an independent healthcare provider for people with learning disabilities who present severe challenges to services. I joined Castlebeck in July 2007, working alongside clinical psychologist Dr Alex Hamlin. As someone keen on a holistic approach to health care, I was gripped by the innovative and exciting approach that Castlebeck has towards treatment. In 2004, Bruce Carribine (then Deputy Manager at Trinity House, a residential care service in Lockerbie), pioneered a local project based on biophilia (see box). The idea was developed by Dr Bunny Forsyth and Hazel Southern in 2005 to link in a wider sense with Corporate Social responsibility. The CREATE project began in 2006 as a long-term sustainable project enabling volunteers (staff and residents) from Castlebeck to work on a conservation site. The site was originally scrubland in an area of urban decline. Prior to our involvement the local residents had formed a trust which had developed a partnership with the local council to begin regenerating the site. Owing to a lack of funding, the resources were limited and progress was slow. Castlebeck set up a sustainable partnership with the trust and the local council. The volunteers became known as the CREATE group. After joining Castlebeck I wanted to get more involved in the CREATE project. I was interested in the short- and long-term health benefits for our residents. Currently there are 42 actively involved volunteers. They reside or work at a number of Castlebeck services (hospitals or residential homes) in northeast England. Every Tuesday the volunteers meet on the site, and under the instruction of the site ranger they complete various tasks including litter picking, path maintenance, bramble cutting, pond clearing, reed and tree planting and other seasonal tasks. During the summer they spend all day out on site, but during the winter months they just work the morning from 10 till 12. In exceptionally poor weather the volunteers meet at the local community centre to do indoor activities with a CREATE theme, for example making bird boxes or doing nature puzzles. Over the last two years the volunteers have developed a particular group identity and involvement in the project appears to have had a positive impact on their lives, in terms of psychological well-being and physical health. My discussions with the volunteers have highlighted a number of themes surrounding the perceived causal mechanisms to this improved sense of quality of life (QoL), to which I turn now. Improved social connections have a positive impact on self-esteem (Seeman, 1996), and forging such connections is a challenge for vulnerable populations, with a profound effect on their health (Young Kim, 2006). Indeed, English Nature have stressed the importance of community links and the need for vulnerable people to forge friendships within a community setup. CREATE provides the opportunity for volunteers to make and maintain friendships with people outside their normal environment, either with the local community or people from other Castlebeck services. This is seen as very important by both residents and staff. One resident has spoken about her sense of belonging to the CREATE group, and the positive feelings she associates with being part of a family. It is clear that not only being part of this group but also having ownership of the group leads to these positive impacts. Maller et al. (2006) conducted a systematic review of the literature and found that contact with nature positively impacted on physical health measures such as cholesterol and blood pressure, and caused stress reduction. The CREATE site provides lots of opportunities for contact with nature. The residents have enhanced their understanding of the natural world and have enjoyed the interactive learning. They appreciate watching the wildlife and the changing seasons. One resident spoke of feeling free to have fun without any pressure to be sensible – splashing in the water and kicking around in the dry leaves. The Royal College of Psychiatry published a leaflet in 2006 on the importance of spirituality in mental health care, highlighting key benefits for individuals who experience a spiritual dimension including improved self-esteem. There is a strong sense of spirituality amongst the group – the volunteers are experiencing a multisensory environment that has a remarkably calming effect. The mounting evidence for contact with nature as a remedy for mental and physical illnesses is creating a change in traditional methods of medical treatment. This has been highlighted by pioneers in the field, such as Eden Alternative Nursing Homes. These novel nursing homes employ the concepts of biophilia and boast impressive findings (Pretty et al., 2003). After the introduction of greenhouses, healing gardens and plants they found physical improvements (a 57 per cent reduction in bedsores), behavioural improvements (60 per cent fewer behavioural incidences) and human resource improvements (a 48 per cent reduction in staff absenteeism). The evidence for physical exercise having an impact on QoL is overwhelming. Indeed, Taylor (2000) and Mutrie (2000) both found strong evidence to suggest that physical exercise has a profound impact on levels of anxiety and can dramatically reduce clinical depression. 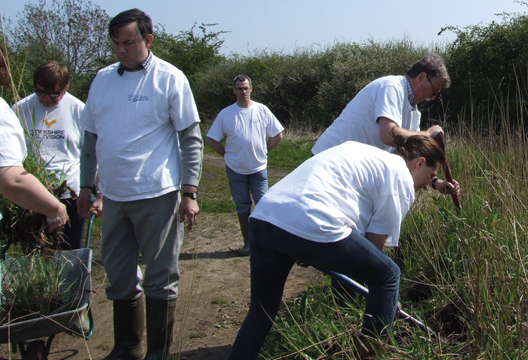 Castlebeck residents have many opportunities for physical exercise in their leisure activities; but involvement with the CREATE project provides exercise incidental to working within the natural environment. The residents are proud of their hard work and the physical effort that goes in to maintaining the site. They have spoken of the satisfaction of physical fatigue after a hard day’s work, and feeling stronger and healthier. One resident has described how the digging and weeding gives him a ‘nice energy’. The impact of physical exercise is twofold – it improves physical health but also impacts on self-esteem. Nature and physical exercise come together to form a new trend in healthy living – green exercise, the benefits of which have been noted by many researchers in the field (e.g. Pretty et al., 2003). ‘Green gyms’ have been described by English Nature as a growing national movement. In addition to the increase in self-esteem, self-confidence and emotional well-being amongst the residents, a further impact of CREATE has been noted. This can be described as a change in attitudes. Discussions with staff, the site ranger and local residents suggest that seeing the obvious aptitude of the residents, and their high levels of enthusiasm, has changed their perception of people with disabilities. Staff members have commented on their tendency to make assumptions about the levels of abilities of residents. One member of staff reflected on the imbalance in many of the residents’ lives between the degree of help and support they receive and the chances they have to provide help and support to others. CREATE provides the opportunity for volunteers to make a positive contribution to their local community. This is an opportunity that has been embraced by the volunteers and this has led to a reappraisal of attitudes amongst staff, local residents and trust members. Within CREATE power dynamics are significantly different to those that might be found within a typical resident/staff relationship. All volunteers have equal responsibility for the work, providing a positive sense of power. This seems to have impacted on the pride that is taken in the achievements of the group, and has led many staff members to reflect on the abilities of residents. Expectations have been challenged and staff and residents have pleasantly surprised themselves and others. People who take part in conservation projects report subjective health benefits, ascribed to being outdoors and to feeling part of a greater system connecting beyond the individual. Such projects can help overcome social isolation among people with disabilities through embracement, develop skills and improve employment prospects as well as provide the known benefits associated with exercise. There appear to be comparable projects being setup around the UK with a similar ‘biophilia’ ethos. The majority of these projects are with either the elderly, physically disabled or those with mental health problems. These are fantastic schemes that can be adapted for different client groups from both community settings and hospital settings. Individuals within hospital settings, perhaps, would benefit the most from widening their social networks, accessing a bit of green space and getting an alternative form of exercise. Biophilia is the love of nature held by humans. The ‘biophilia theory’ refers to the hypothesis that humans have a need to be connected to nature. This term was first used by zoologist Edward Wilson in 1984, who described how humans subconsciously but actively seek out contact with the natural world. This is not a new concept – it was strongly advocated by Konrad Lorenz back in the early 1970s. Evidence to date often lacks robust designs, but the few controlled trials and the anecdotal data are strong contributors to the notion of the beneficial impacts of biophilia. Frumkin (2001] produced a comprehensive review, evidencing that contact with the natural environment will have a positive impact on mental and physical health. The review did find consistent results across some robust studies, but it also demonstrated the need for more empirical evidence. In particular, there has been both qualitative and quantitative research around mental health and the elderly, but there is very little evidence for other vulnerable groups. Burts, A. & Caan, W. (2005). Human health and nature conservation. British Medical Journal, 331, 1221–1222. English Nature (2003). Nature and psychological well-being. Research report 533. London: Author. Frumkin, H. (2001). Beyond toxicity human health and the environment in American Journal of Preventive Medicine, 20, 234–240. Maller, C., Townsend, M., Pryor, A. et al. (2006). Healthy nature healthy people: ‘Contact with nature’ as an upstream health promotion intervention for populations. Health Promotion International, 21(1). 45–54. Mutrie, N. (2000). The relationship between physical activity and clinical defined depression. In S.J.H. Biddle, K.R. Fox & S.H. Boutcher (Eds.) Physical activity and psychological wellbeing. London: Routledge. Pretty, J., Griffin, M., Sellens, M. & Pretty, J. (2003). Green exercise: Complementary roles of nature, exercise and diet in physical and emotional well being and implications for public health policy. CES Occasional Paper 2003-1. University of Essex. Seeman, T.E. (1996) Social ties and health: The benefits of social integration. Annals of Epidemiology, 6(5), 442–451. Taylor, A. (2000). Physical activity, anxiety and stress. In S.J.H. Biddle, K.R. Fox & S.H. Boutcher (Eds.) Physical activity and psychological wellbeing. London: Routledge. Young Kim, H. (2006). The outcomes of social exclusion: Social network effects on individuals’ health. Society for Social Work Research.